﻿ How can you recover hard drive data after format? Position: Home > Hard disk format recovery > How can you recover hard drive data after format? The Format commands are typically run to prepare a new logical drive for using after Fdisked hard drive - enabling the installation of an operating system, application programs & eventual user data. When you format a disk, the operating system erases all information on the disk, tests the drive to make sure all sectors are reliable, marks bad sectors, and creates internal address tables. You must format a disk before you can use it. If you accidentally format your hard drive or disk that contains useful files, do not be panic, you can still recover your lost data. Bitwar data recovery software can help you. Bitwar data recovery is the best format recovery software that can help you to recover files from a formatted hard drive in quickly and easy-to-follow steps. It is compatible with all the versions of Windows including 10, 8, 7, Vista and XP. If you are suffering from data loss disaster caused by hard disk formatting and trying to find a reliable format recovery solution to rescue your files, just with simple clicks, it can help you recover formatted hard drive and get back all your lost data. For a successful data recovery, there is one thing you should take care: once the partition or hard disk is formatted, the original files still exist and they can be easily covered by the new files. Once these old files are corrupted, even if you perform format recovery, you cannot open and use them anymore. It means that you have to recover formatted data from hard disk as soon as possible. You should download and install Bitwar data recovery on your computer, follow the step-by-step procedure on how you can recover data from formatted hard drive. If your formatted drive is an external device, you should connect it to the computer and retrieve it like hard drive. Tips: Remember not to save other files or install Bitwar Data recovery to your formatted partition. Launch the Bitwar Data Recovery and install it.Select the partition or device where you want to recover your files and click "Next". You can use “Formatted Recovery” mode to Recover formatted files after performed a quick format on a partition or hard drive. Select “Formatted Recovery” and click on the "Next" button. 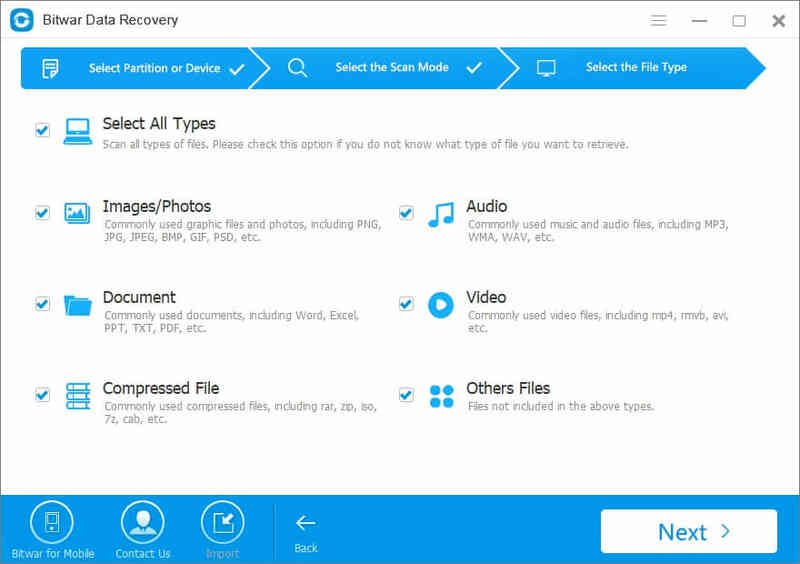 And if files are not found under Formatted Recovery, you can try deep scan on this page. The deep scan will search every sector of the hard drive to see all existing files. But the scanning process will spend more time than quick scan and will not have the original file name in the scanning results. Select the file types you want, Bitwar Data Recovery can recover all kinds of files. If you want to restore all types, select “Select All Types” and click “Next” to start scanning. While scanning, you can pause and stop the scanning processes to preview the found data you scanned out. You can also export the scan results by clicking Export Scan Status, and import the use when needed. After the scan, preview all the listed recoverable files. You can preview them one by one to make a selective recovery. When you have determined the files which you want them back, select it and click the "Recover" button to save it to another partition or external device. Caution: Save the recovered data to another partition or drive instead of the formatted one, for it may result in overwriting data and permanent data loss! With the action above, you will have get the hard drive data back after formatted. While the reasons for data loss in hard drives are mostly physical, sometimes they are also due to a mere human error. When your hard drive accidentally formatted, it’s best to stop using your computer after closing off all the unnecessary programs. It is possible to restore a formatted hard drive because all the erased data is still stored on the hard drive as long as it is not overwritten by new data. Summary：Accidental formatting is one of the main reasons that cause memory card data loss. Bitwar Data Recovery is a reliable and free trial data recovery software.